The National Conference leader said these elections are very important because certain forces are trying to divide the people of the country. Farooq Abdullah accused the BJP-led central government of diverting attention. 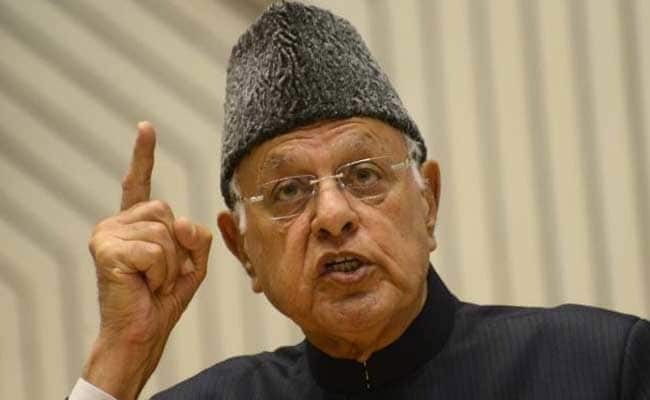 National Conference leader Farooq Abdullah on Saturday said the Bharatiya Janata Party (BJP), which once had the construction of Ram temple in Ayodhya as its main issue, has forgotten about it after the air strike carried out by the Indian Air Force (IAF) at terror launch pads in Pakistan. "Previously the temple issue was important for them but where it is now? Has Balakot eaten it?" Mr Abdullah said at a public gathering. He also accused the BJP-led central government of diverting attention from main issues and said, "A lot of Indian soldiers lost their lives in Chhattisgarh but Modi ji never went to meet their families. But when 40 CRPF personnel lost their lives... I have my doubts and I tell you the truth... he raised a storm over it." "He (PM Modi) attacked Pakistan and we killed 300, some say 500 and some say 1,000. We also shot down their plane just to show that he (Narendra Modi) is very brave and can do anything. Through all this, he tried to make everyone forget about farmers and jobs," Mr Abdullah added. Questioning about the jobs for youth, he said, "He (Prime Minister Modi) promised that he will give 2 crore jobs to the youth in a year, which makes 10 crore in five years. Where are those five crore jobs? He said he will reduce the price of petrol, diesel and, LPG but nothing happened," he added. Mr Abdullah blamed Mehbooba Mufti-led PDP for bringing BJP to the valley by allying with them. "Today Mehbooba is only lying about not allowing action against Jamaat-e-Islami and others. It is PDP which brought BJP to the valley after getting 28 seats," he said. Mr Abdullah also credited former Prime Minister Manmohan Singh for the successful launch of ASAT missile. "The Anti Satellite Missile got made by the then Prime Minister Manmohan Singh but he didn't declare it. But today when there is an election, he (Modi) pressed the button to show as if Hanuman ji has come himself." "A similar button was pressed, which made a helicopter crash and killed 6 of our jawans," Mr Abdullah claimed in an apparent reference to the Mi-17 chopper crash that took place in Budgam last month.